I’m always a little sad at the end of a major tournament, which is probably why it’s taken me some time to write up the final. Brazil 2014 was particularly special, thrilling and yet strangely confounding of the ordinary conventions of an exciting tournament. Something of the same feeling, I suspect, was behind Brian Phillips‘s extraordinarily thoughtful yet wistful final reflection on the tournament (and I strongly encourage you to read it if you haven’t). Although Mario Götze’s late winner left this World Cup sharing the record for most goals in a tournament, it was pre-eminently a tournament of goalkeepers. It was also a tournament of three-at-the-back, though only the Netherlands, among the semi-finalists, employed that system (Argentina used a 3-5-2 in their opening game, but quickly abandoned it). The death of tiki-taka was confirmed (Bayern Munich may yet revive the corpse, but not this summer)–but so too the parked bus, both at the hands of tiki-taka’s fraternal twin, the high press. CONCACAF (especially if you throw in its nearest CONMEBOL neighbor, Colombia) proved the geographical belle of the ball. One of the finest goals of tournament was scored by an MLS player. Personally, this tournament was completely satisfying despite thwarting every particular expectation and desire I had about how the games would unfold (with the notable exception of the United States’ performance in the group stage, a fully unexpected but deeply pleasing result). In that regard, as in so many others, the final game was a perfect ending to a magical, delicate World Cup. Germany won with a stunning goal after penalties seemed all but certain, and after Argentina had had the better game despite conceding possession to Germany throughout (as one would expect when a counter-attacking side faces a more pro-active one). They were the better team for all but the final 5′ of a closely contested first half, though in fairness Germany’s strong finish probably evened things out for that period. Argentina most definitely had the better chances throughout the second half, Germany only coming into their own offensively in the final 10′ of regulation. Extra time was again very even, Germany controlling possession but Argentina looking to break on the counter, with each side getting one good chance. The one way in which the game significantly trended in Germany’s favor was Argentina’s increasing tiredness, especially visible from 80′ on. The differing semifinal experiences of the two teams looms large here, with Germany essentially finished after 30′ while Argentina labored through extra time with a day less to recover. 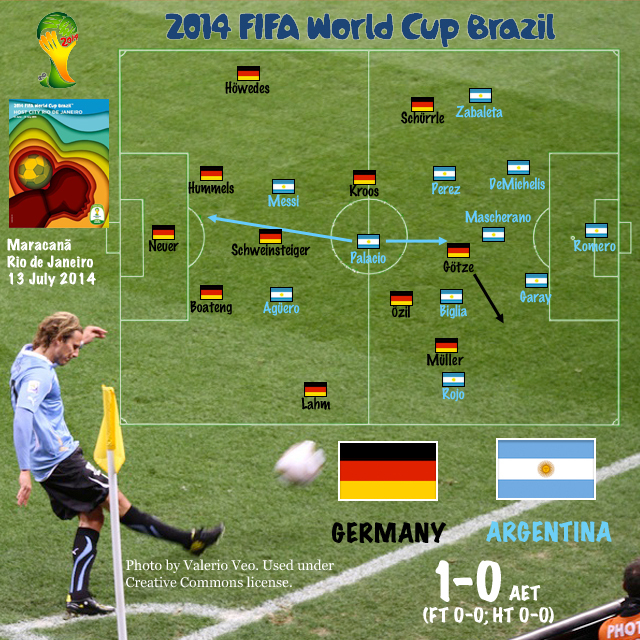 Had Argentina faced Brazil and Germany, Netherlands, a final of such fine margins might have played out differently. Yet the narrowness of the margins was what created such a great game, a game that in truth deserved a tie–attainable in life and regular play, but impossible beyond the group stage. This tie was at least decided by a moment of footballing brilliance, as utterly thrilling a finish as one could hope for. It happened so quickly that time did not even have a chance to stand still. And seven minutes later (nine, strictly speaking), a month and a day came to a close. Argentina, dressed in dark blue, began the game in a 4-4-2, with Lionel Messi slightly more advanced than in their semi-final game against the Netherlands and Ezequiel Lavezzi swapping with Enzo Perez to play on the right rather than the left. Perez was tasked with helping contain Philipp Lahm, leaving Lavezzi free to attack Benedikt Höwedes down the right. To be sure, Argentina’s attack in the first half worked almost entirely down the right flank, Messi often joining Lavezzi on that side. But Messi’s more advanced positioning, I think, was more generally designed to test Germany’s high line–or perhaps was a result of Messi seeing the opportunities it presented. In either case, it led to a dual role for Messi, as he continued to drop back to link with the midfield. Despite the unexpected loss of Sami Khedira to a thigh injury during the warm-ups, Jogi Löw stuck with the 4-3-3 that Germany had used in their two previous games, the young Christoph Kramer, previously a late-game substitute (against Algeria and France), stepping into the starting role of a lifetime. Tragically, his 17′ collision with Ezequiel Garay robbed him of any memory of this opportunity, though he remained on the pitch for another 16′. It would be unfair to say he was wandering aimlessly high up on the pitch, as his attacking moves still showed some purpose; but he demonstrated no inclination to come back, even during a dangerous free kick that saw the rest of the midfield inside the box, and was generally glassy-eyed throughout. Pretty clearly he should have been removed immediately, and FIFA needs to revise their rules to require independent testing for concussions and allow a free substitution for players deemed unfit to continue. Otherwise players and managers, constrained by the game’s frankly medieval substitution rules, will continue to make poor decisions. With Kramer now roaming just beneath Klose, Toni Kroos began to drop back alongside Schweinsteiger, creating a hybrid 4-3-3/4-2-3-1. It was not long after he began dropping deeper, at 21′, that Kroos very nearly gave the game away with a strikingly unwise back header, presumably to Hummels but over-shooting him to put the ball at the feet of Gonzalo Higuaín in behind. Fortunately for Kroos, probably Germany’s best player over the tournament despite a sub-par final, Higauín repaid one blunder with another and badly missed his shot. Finally, at 32′, Jogi Löw replaced Kramer with Andre Schürrle, Mesut Özil moving to the inside right position as Schürrle took over on the left flank. Germany saw out the first half in this 4-3-3. Germany had 70% possession in the first half, and attacked, when possible, down their own right flank. Philipp Lahm got forward to combine with Thomas Müller and with Özil after the introduction of Schürrle. These chances increased as the half went on, but never looked quite as threatening as Argentina’s earlier, poorly finished attacks. Argentina came out to start the second with Sergio Agüero replacing Lavezzi and Messi dropped off behind the strikers in a 4-3-1-2 (Lucas Biglia and Perez also swapped sides, returning the latter to his more natural position). Manager Alejandro Sabella has received significant criticism for this decision because of Lavezzi’s strong play stretching the German defense on the right, and probably also because, throughout the tournament, the side had looked more balanced with Lavezzi in it. Yet Argentina had a flurry of half-chances to start the second half, three of them in the opening 2′. Among them was Messi’s best opportunity of the game, Biglia playing him in behind the defense on the left for a free shot on goal that was always bending away (the others were an Higuaín cross for an ever-so-slightly offsides Agüero and a Messi pass for Agüero just pipped by Jerome Boateng). 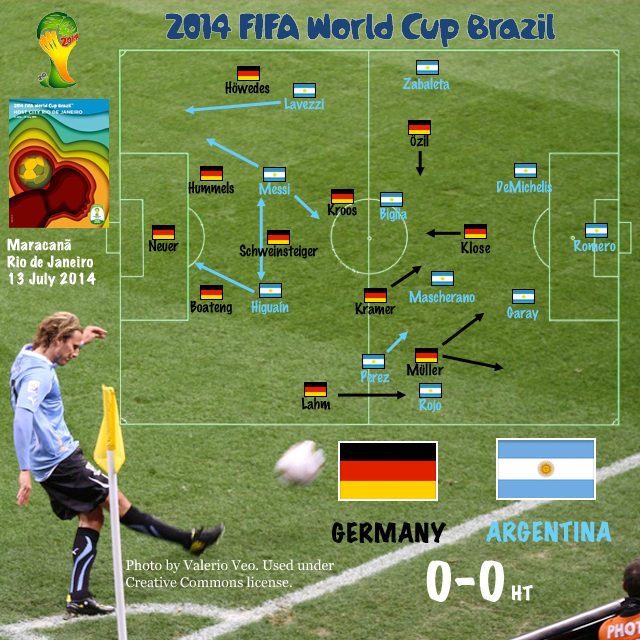 Very quickly, Kroos dropped back alongside Schweinsteiger to bolster Germany’s defense, and they remained in this 4-2-3-1 formation until near the end of regulation, when Argentina’s counter-attacking energy began to flag. By the end of regular time, Germany’s possession had dropped to 62%, suggesting around 54% possession for the half; and they had only a slight edge in passing in comparison to their dominance in the first half and in extra time. Central to the change was Messi’s deeper-lying position, though he was not really working to link up play. Instead, the role allowed him to conserve more energy, arriving late to attacking sequences while others battled with Hummels and Boateng. Mascherano and Argentina’s center backs were heaving balls forward for Higuaín and Agüero to win, which they did relatively effectively. Michael Cox’s claim that “Lavezzi was removed prematurely and left Argentina lacking energy upfront” seems fair enough in one sense. But if the change was made primarily because Messi was already lacking the energy to continue implementing the first half strategy, it’s far from clear that squeezing that extra energy out of Lavezzi would have been worth the cost to Messi’s contributions. It’s perhaps best to think of the early substitution as a gamble, and once we know that Argentina’s early flurry didn’t bear fruit, it’s easy to say it was the wrong call. If you knew a substitution would give a rapidly tiring Messi an open chance on goal within 2′, would you make that call or hold off to see if Lavezzi could win you the game? Whatever the merits or faults of Argentina’s second half strategy, it most certainly did further reduce Messi’s energy as well as the rest of the team’s. For all intents and purposes, extra time began in the final 10′ of regulation, as the nature of the conflict shifted and both sides made their final substitutions in preparation for the next 30′. Germany shifted back into a 4-3-3 with significant possession around the edges of Argentina’s box, and right before extra time they brought on Mario Götze to replace Miroslav Klose. He floated freely across the top of the German attack, especially drifting right to link up with Müller and Özil. Argentina had already brought on Rodrigo Palacio for Higuaín, and in extra time he played behind Agüero and Messi, undoubtedly to serve not only as a link between midfield and attack (as Messi had not), but also to provide an extra set of fresh legs to help defend in the midfield. Palacio’s energy was badly needed, both on defense and in attack, but he looked no more in sync with his teammates in this game than he had in previous ones. Neither team looked likely to win this game, and the difference really was down to two finishes. At 97′, Palacio’s chest trap wasn’t perfect and Neuer was quick off the line to pressure his attempted dink. At 113′, Schürrle started down the left flank innocently enough. Not so innocently, as it turned out. It was the only time in the entire tournament that Argentina trailed anyone. Martín DeMichelis (Arg) – DeMichelis was a whipping boy for many Premier League fans, who questioned his inclusion in Manchester City’s starting XI because of his lack of pace and tendency to make errors at crucial moments. Yet DeMichelis is a sharply intelligent and pro-active defender. Replacing the unconvincing Federico Fernández in the Quarterfinals, he clearly solidified what was already the stingiest defense in the tournament. This game highlighted what Manuel Pellegrini and Sabella see in the defender, but it will also have reaffirmed his detractors’ frustrations. In the final, he was his team’s second most prolific passer (after Javier Mascherano), and a comparison of his passes with those of his fellow center-back, Ezequiel Garay, demonstrates his advanced positioning (notice that Garay passes are focused in the third band of “grass,” while DeMichelis’s are mostly in the fourth). Notice, too, the more controlled and diverse nature of his passing (19 of Garay’s 35 passes were long outlets either to Rojo on the flank or to DeMichelis across the pitch). In addition to his aggressive positioning and distribution from the back, DeMichelis led his team with nine ball recoveries and all players with six interceptions, both suggesting his effective anticipation of play. That anticipation and pro-active stance is what managers value in DeMichelis, and it was very much on display in this final. The thing about anticipation, though, is that it tends to leave you with your pants down when things don’t work out. A number of commentators have noted the angle of DeMichelis’s run on Götze’s goal, allowing the striker to slip away from him and creating the opportunity for the game-winner. That seems a bit harsh to me, but however one judges that final action (you can do so yourself in the vine above), it’s clear that what DeMichelis is doing is covering the passing lane, anticipating an interception to cut Götze out of the play. Though less incisively punished, DeMichelis also gave Germany an excellent opportunity at 62′, his effort to find the right pass rather than simply clearing allowing Miroslav Klose to strip him of the ball and spark a quick attack in behind him. At 33, DeMichelis is not capable of recovering when caught out like this, and it was left to Mascherano to snuff out that threat. DeMichelis is thus a player who forces managers to ask whether the juice is worth the squeeze. Unfortunately for him, the squeeze is usually much easier to see than the juice. It is true that none of Messi’s shots were on target, and that the majority of his take-ons occurred in the middle rather than the final third. He also had virtually the lowest running distance covered per minute in the entire tournament (of the 45 lower-ranked players, all were goalkeepers except for three defenders, including Thiago Silva, and two 33 year-old outfielders, one of them Samuel Eto’o), though Benjamin Morris offers a strong argument that this is a feature of his playing style and therefore not reliable evidence of his tiredness or a poor performance. More indicative of a poor performance were Messi’s passing numbers, which dropped notably. Though the number of passes attempted was about the same as in his last game, Messi suffered his lowest pass completion rate in the tournament, roughly 10% lower than in his two previous games. Even more significant was that the missed passes came almost entirely in the attacking third, where Messi had a performance utterly unlike any other this tournament. That stat–44% completion on 8 of 18 attacking third passes–is almost certainly the most important indicator in the game. The only game that approached comparison was his opener against Bosnia-Herzegovina, where Messi had a 58% completion rate; but in that game, he made up for poor quality with high quantity, completing as many attacking third passes as he attempted in the final. For a more general comparison, Morris (in his exceptional quantitative analysis of Messi) puts Messi’s overall pass completion rate with Barcelona at 83.8% and his forward pass completion rate (not, I know, exactly the same metric as final third passes) at 74.4% (Morris’s data set appears to be the four years since the previous World Cup). This would suggest that Messi was slightly better than his club average in the group stage and slightly below it in the knockout round, with the very notable exception of the final. Coupled with his failure to get a shot on target, this collapse in final third passing confirms that, despite probably being the most influential player on the pitch, Messi’s had a poor game by his standards. Given the magnitude of the drop-off, it seems likely that it was a combination of a poor individual performance (because of exhaustion, some other reason, or for no reason at all) and an excellent defensive effort by Germany. Which brings us to . . .
Bastian Schweinsteiger (Ger) – Most commentators had Schweinsteiger as the Man of the Match, and rightly so. Dealing with two unanticipated changes in the opening 20′ could have thrown the midfield into chaos, and Kroos certainly seemed to suffer on the day. Schweinsteiger, however, proved unflappable. He led all passers and played a critical role in containing Messi, especially once he moved to a more central position in the second half. It is probably also a measure of his importance in this game that he was the most fouled player, four of his six fouls coming in extra time, and three of them before Germany’s goal. The penultimate foul, a hand across his face in an ariel duel with Sergio Agüero, left him a bloodied embodiment of German midfield grit, one of the iconic images of the game. At Euro 2012, Schweinsteiger played injured, and though he showed well in the hardest of groups, his poor play in the knockout stages was a significant factor in Germany’s exit. In this tournament, he followed the opposite arc. Not appearing in the first game, not starting until the final group game against the United States, and not appearing in this critical holding role until the Quarterfinals, Jogi Löw’s reintroduction and redeployment of Schweinsteiger as his deep-lying midfielder was central to Germany’s evolution into champions. Though Schweinsteiger was probably not as good as Kroos over the course of the whole tournament, his role may nonetheless have been the most significant one for Germany’s development. At 121′, Javier Mascherano drove up the middle of the pitch past Thomas Müller and slipped a pass between Kroos and Schürrle for Lionel Messi. It was Schweinsteiger who stopped the attack, fouling Messi 28 yards from goal on the right. It set up a free kick for Messi that was effectively the final action of the game, and the Argentine’s shot was well off-target. It was an entirely fitting end to a remarkable, tightly-contested final.